Christmas; a time of joy, love and happiness. A time for spending time with family and appreciating those around you. Oh, and also a time of SHEER AND UTTER PANIC because HOW IS IT CHRISTMAS AGAIN ALREADY AND I HAVE ABSOLUTELY NO IDEA WHAT TO BUY ANYONE AND I HAVE NO TIME TO GO OUT SHOPPING. Ah, Christmas. I have specific trouble with choosing presents for people who are quite closely connected to me, BUT we're not personally close and casual enough with each other that I could just bowl up to them and ask 'Hey, what can I buy you for Christmas?' like you can with your best pals or mother ...if that makes sense. For example, my best friend's mother; I know her quite well and I'm still confident that I could choose something she likes, but I'd still play it reasonably safe. I'd put 'best friend's mother' in the same category as mother-in-law, father-in-law and close family friends. Fear not - because many shops have clearly cottoned on to the fact that a large proportion of us are absolutely useless, disorganised and/or lacking in ideas when it comes to gift buying and so have created specially dedicated 'Gifts for Her' and 'Gifts for Him' sections on their websites. Which is also convenient for those of us who literally don't have the time (or the will to live) when it comes to venturing out to the actual shops. Today I'm showing you a few gift ideas from Boots which can all conveniently be ordered from the Boots website - and even better, a lot of these things are also part of the 3 for 2 deal! Also bear in mind that I'm not necessarily suggesting that these individual gifts be a 'main' present - but they definitely could be. It all depends on your budget and how many people you're buying for. If you have a larger budget, you might be buying a 'main' present and then a few bits and bobs, or you might create a little selection of bits and bobs and that is the main present in itself. 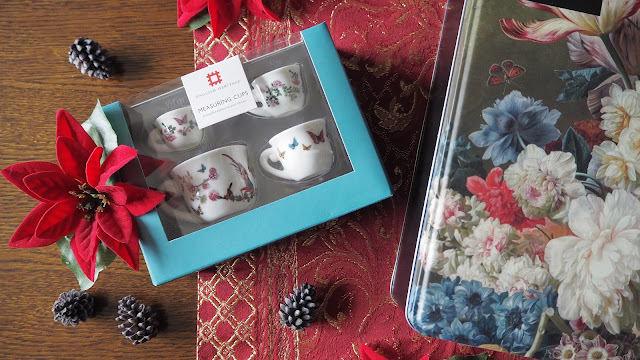 I've noticed over the last few years that gift guides have become increasingly costly and a £45 candle is often classed as a 'stocking filler' - that's great, but just not possible for everyone, and also not necessary. Whatever your budget, there's absolutely no shame in buying someone a gift of 'lesser' value if you've put thought and love into it. So; here are some of my favourites. So, the first item is arguably my favourite. A TIN OF BISCUITS. 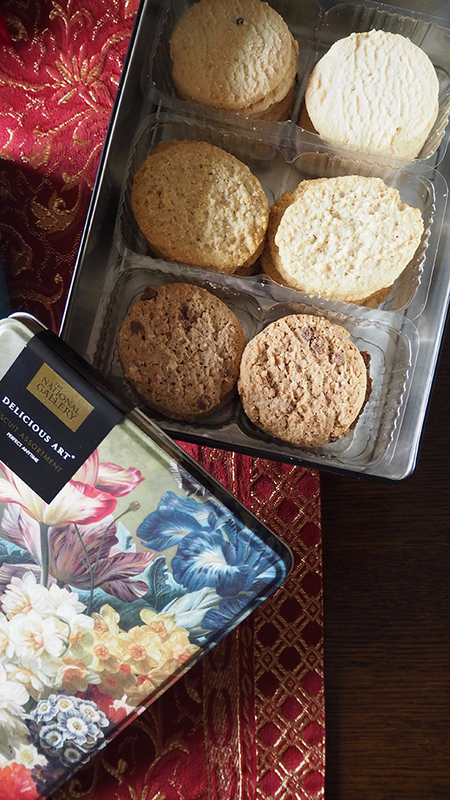 The Delicious Art Biscuit Tin is adorned with a painting from The National Gallery. 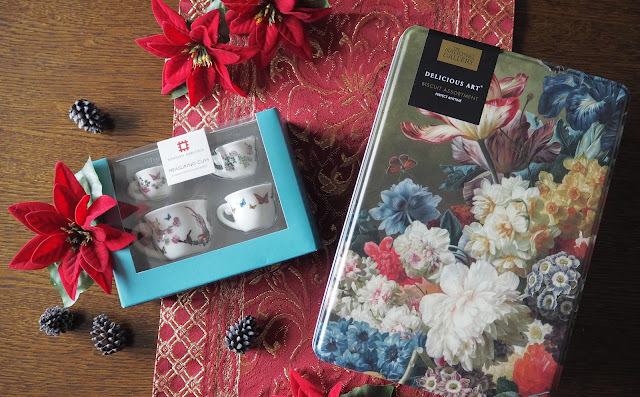 Not only is the tin very aesthetically pleasing AND reusable (arty alternative to the Quality Street sewing box?) but it's also filled with biscuits. BISCUITS. Who doesn't like biscuits?! Next, these utterly adorable English Heritage Measuring Cups. 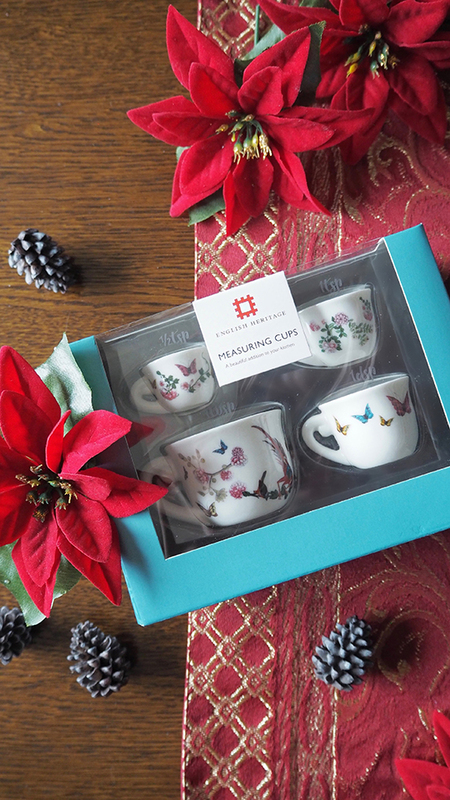 The little ceramic cups decorated with birds, flowers and butterflies measure 1/2 a tsp, 1 tsp, 1 dsp and 1 tbsp. A charming and thoughtful gift for anyone who enjoys spending time in the kitchen! 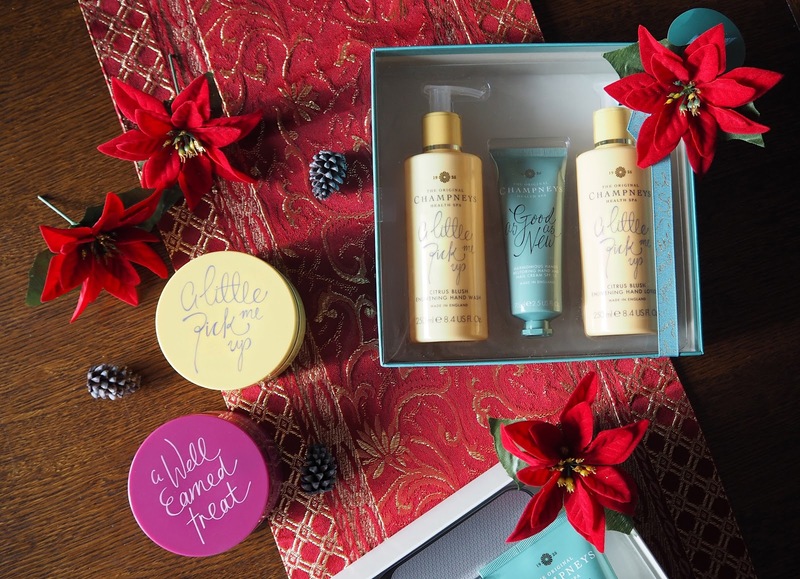 Then, Champneys Pedicure Gift Set A real pampering treat for the feet, without the awkwardness of going and getting a proper pedicure in a salon/having a stranger be that up close and personal with your unshaven winter calves. I mainly find pedicures uncomfortable because I have excruciatingly ticklish feet - I often spend the entire duration squirming and squeaking whilst being given looks that says 'why are you even here?!' In my opinion, this is quite a safe bet. 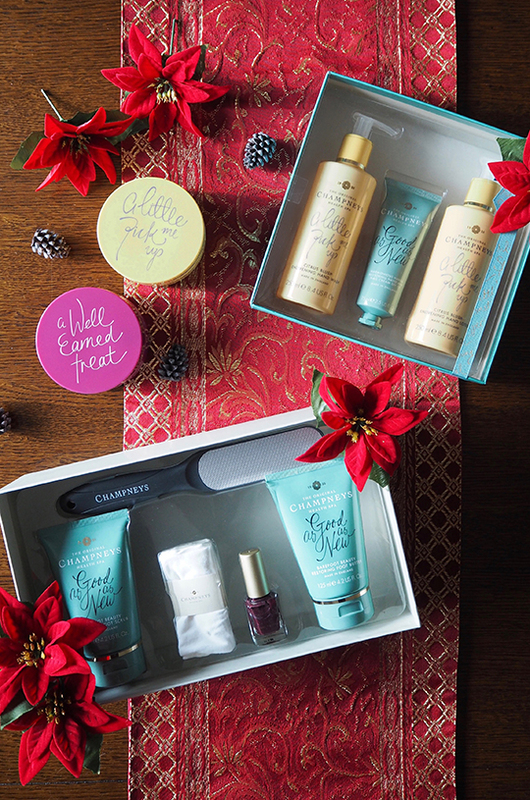 The set includes a Barefoot Beauty Restoring Foot Scrub, a Barefoot Beauty Restoring Foot Butter, a Nail Polish in a festive dark red, moisturising socks and a double foot file - all for a reasonable price too! Finally, Champneys Hand Trio. Another safe bet. 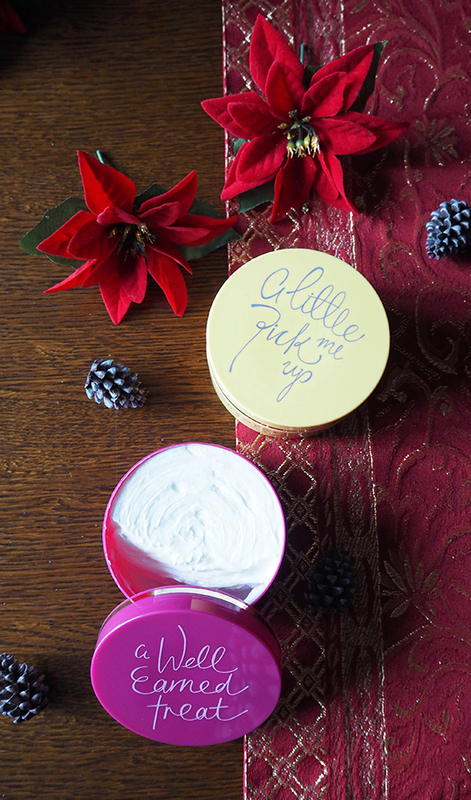 The hand equivalent of the pedicure set - who doesn't like and use hand cream? Especially in the dry winter months. It's also one of those slightly indulgent things that you don't often buy for yourself because it isn't exactly a necessity, but when someone buys it for you, you use up every last drop and then wait patiently for the next birthday/Christmas. 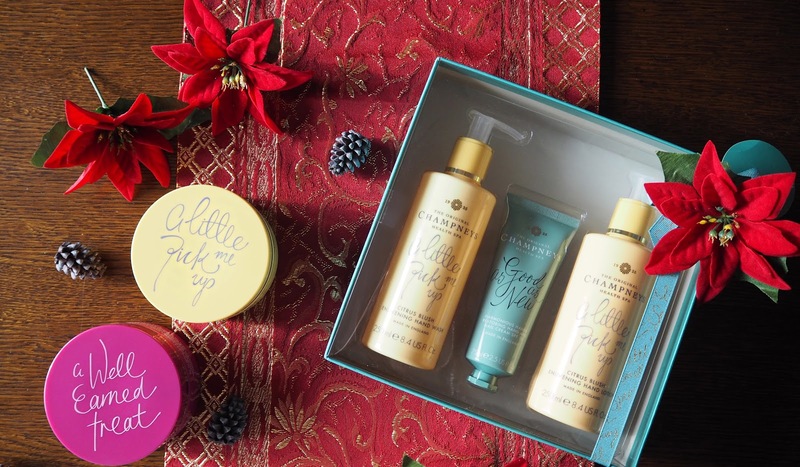 The set contains the Citrus Blush Enlivening Hand Wash, the Citrus Blush Enlivening Hand Lotion and the Harmonious Hands Restoring Hand and Nail Cream (SPF15). I hope you found this post helpful, and also remember that even if you don't purchase these exact gifts, they're still ideas. Sometimes even just reading through a gift guide can spark some inspiration. Let me know if you've bought any presents already, or if you're having trouble!